The Kunene River forms a natural border between Namibia and northern neighbor Angola and is one of the few perennial rivers in the country. Being approximately 1,050km in length, it is the lifeline of the local Himba tribes and harbors beautiful fauna and flora species. The blue green waters are in stark contrast with the desert landscapes on both sides as it flows through the dry Kaokoland. Although a lifeline, the reed beds along the banks hide gaping crocodiles. Its flow and water levels are subject to the Ruacana Hydroelectric power plant as well as the torrential rains to the north. Various adventure and relaxing activities are offered by the many picturesque lodges and camps nestled on its banks, these include white water rafting, fishing, canoeing and scenic hiking trails. The river is majestic and beautiful with a myriad of birds, insects and wildlife hovering alongside. The estuary on the Atlantic coast to the west is a protected area due to its fragile nature and also due to it being the breeding site of two rare species of turtle. As the Kunene River snakes through the Kaokoland, its horizontal flow is interrupted as it playfully pours down a narrow gorge to form the beautiful Epupa Falls, the drop can be as long as 60m in some areas. 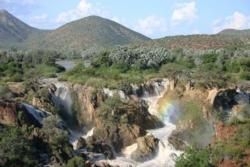 The Herero named it Epupa due to the way the water kicks up plumes of white spray as it descends down the gorge. The area around the falls are equally as beautiful, flora abounds in the form of massive baobabs and mighty fig trees while various bird species such as kingfishers and the rare Rufous-tailed palm thrush color the skies above. Various activities are offered by the surrounding lodges, these include boating, fishing, breathtaking hiking trails and white water rafting. The Epupa Falls are considered to be the oldest rock formation in Namibia with an estimated age of between 2,100 million and 1,750 million years.